Written by three leading scholars with vast experience in the science and practice of assessment centers (ACs), this is the first volume to comprehensively integrate variations of the assessment center method with alternative talent management strategies. A useful reference guide, it examines the many ways in which organizations can apply the assessment center method to achieve their talent management goals. It provides balanced and in-depth coverage of theory, research, and practice pertaining to the dimension-, task-, and multifaceted-perspectives on the AC method. Ideal for researchers, practitioners, and students alike, and well suited for courses in testing and measurement, personnel selection, HR planning and staffing, training and development, and organizational change, Assessment Center Perspectives for Talent Management Strategies is a complete and up-to-date account of the assessment center method. 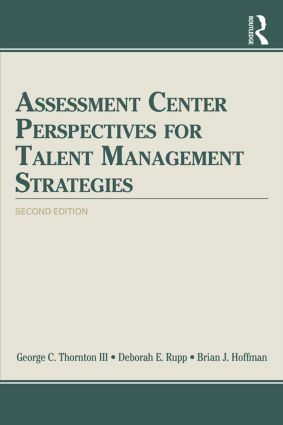 "Assessment Center Perspectives for Talent Management Strategies is the most comprehensive book about assessment center methodology ever written. It explores what is happening now and what to expect in the future. It is a must-read guide for current users and people considering adopting assessment center methods. "—William C. Byham, Ph.D., Chairman & CEO, Development Dimensions International, Inc.
George C. Thornton III is Professor Emeritus of Psychology, Colorado State University, USA. Deborah E. Rupp is Professor and William C. Byham Chair of Industrial/Organizational Psychology, and Affiliate Professor, Krannert School of Business, Purdue University, USA. Brian J. Hoffman is an Associate Professor of Psychology, University of Georgia, USA.